For the past few months I've been looking for an old AWD vehicle with some cargo room. The Mercedes 300TE 4Matic was on the top of the list. 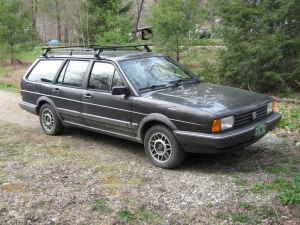 I looked at a few old Audi wagons and a couple of Jeep Cherokees. I even briefly thought about buying a friend's Mercury Mountaineer, until I spent a weekend driving it. I never thought to look at a Volkswagen Quantum Syncro. I don't know why. The The Syncro system was only available on the station wagon. VW felt that if they offered it on the Quantum sedan, it would cut into the sales of the Audi 4000 sedan. That's understandable. The Quantum was every bit the near-luxury car the Audi was at a slightly cheaper price. This Quantum Syncro Wagon (or QSW, as the owners like to call them) is located in Vermont. That's usually bad news for 1980s cars, as rust protection was nowhere near as good then as it is today. However, this one spent all but the last 6 months of its life on the west coast and is rust free. The car is in good shape mechanically, too. 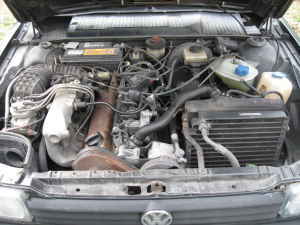 The top end of the engine was recently rebuilt and it has new tires, shocks, struts and a battery. It has also had the "clutch repaired", but the seller gives no details. This car does need a little work, but it's all minor. It needs some exhaust work, a few dash lights replaced (typical VW / Audi problem) and the antenna was liberated by a car wash. That's all pretty easy stuff and not too expensive. These cars are becoming fairly rare. There were only 3000 or so sold in the US between 1985 and 1988. Most were sold in the snow belt areas and many have rusted away. Finding a decent, inexpensive AWD car is not that easy here in New England. I'll now expand my search to include the QSW. 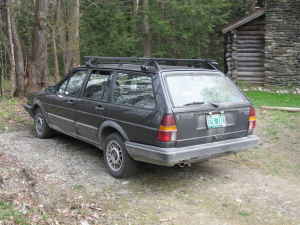 I'm tempted to find out where Hinesberg, Vermont, is and look at this car this weekend. Click here to see the Craigslist ad for this car. I used to have a 1986 QSW. I sold it with 212k on it. I live in MA and it was a great car for New England whether. They were extremely rare. Just over 1500 were sold in 1986. However, that's not the rarest AWD car I've owned. This car was really rare with about 109 sold in each year it was available. I had a 1989 Toyota Camry All-Trac. It was a 4cyl, 5 speed manual, awd car. It looked just like a regular Camry but it was all-wheel drive. Anyway, for more info on the QSW check out the syncronized website.